Dey Street Books, 9780062468130, 384pp. Pioneers of Britain’s nascent Rock & Metal scene back in the late 1970s, Iron Maiden smashed its way to the top, thanks in no small part to the high-octane performances, operatic singing style, and stage presence of its second, but twice-longest-serving, lead singer, Bruce Dickinson. As Iron Maiden’s front man—first from 1981 to 1993, and then from 1999 to the present—Dickinson has been, and remains, a man of legend. 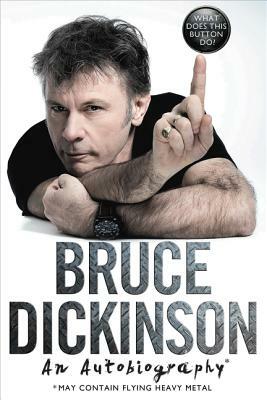 Bold, honest, intelligent and very funny, his memoir is an up-close look inside the life, heart, and mind of one of the most unique and interesting men in the world; a true icon of rock. Bruce Dickinson has been the lead singer of Iron Maiden for more than thirty years, and has pursued a successful a solo career, as well as a host of interests beyond music. Iron Maiden has sold over 90 million albums & performed over 2000 shows worldwide, making them one of the most successful rock acts of all time. He lives in London, England.